Sister Mary Regina Steffe, S.S.J. 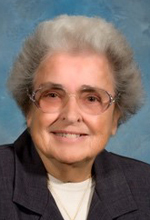 (formerly Sister Margaret Alphonsus), died Dec. 12 at Abington-Lansdale Hospital. She was 88. The daughter of the late Alphonse and Margaretta Steffe, Sister Mary was born in Philadelphia and attended St. Joachim Grade School and Little Flower High School. In September 1950 she entered the Sisters of St. Joseph, Chestnut Hill, and professed her final vows in 1958. She ministered in the archdioceses of Baltimore and Philadelphia. Sister of the late George Steffe, she is survived by siblings Kathryn Duffey and Gerard Steffe. She is also survived by nieces, nephews, 24 great-nieces and nephews and members of her congregation, the Sisters of St. Joseph. The funeral Mass was celebrated Dec. 19. Donations may be made in Sister Mary Regina’s name to St. Joseph Villa, 110 Wissahickon Ave., Flourtown, PA.